Underground cables are predominant in the US, commonly done for electricity and telecommunication wires. It replaces overhead cables which are few meters up in the ground, especially in areas with numerous tall buildings. Underground cables are ideal for congested areas like cities and factories. However, it requires a bigger construction budget as it needs to be buried underground to ensure that it is protected and won’t cause harm to anyone. What are the Types of Underground Cables? The underground cables are classified in two ways: voltage capacity or construction. Low-tension cables – maximum capacity of 1000 V (1KV). It is most widely used among all cables, applied frequently in electric power distribution and control cables that carry signals from electrical devices or switch gears to control room. High-tension cables – maximum of 11KV. Commonly used for electric power transmission at high voltage, it may be for underground or underwater. It helps in the reduction of power loss. Super-tension cables – rating of between 22 KV and 33 KV. This uses low viscosity oils for impregnation. Extra high-tension cables – rating of between 33 KV and 66 KV. Extra super voltage cables – maximum voltage ratings beyond 132 KV. 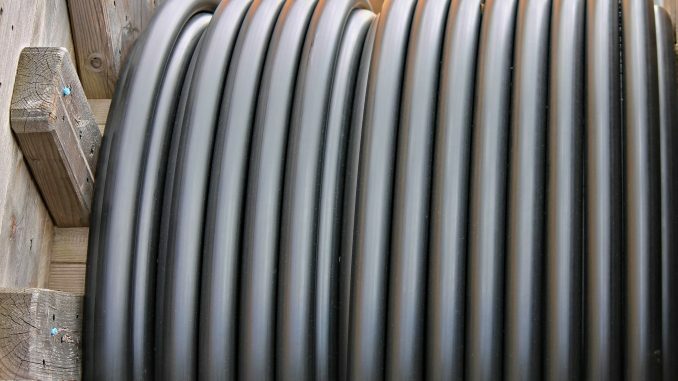 Belted cables: the maximum voltage is 11KVA. Inside has usually three conductors that are clustered together and then joined by an insulating paper belt that is impregnated with a suitable dielectric. The gaps between the conductors and the belt are filled with fibrous dielectric materials. If there’s one notable characteristic, that is the shape is not a perfect circle to take advantage of the available space. However, it is not ideal for voltage level above 11KV because the dielectric strength falls after a few years. Screened cables: the maximum voltage is 66 KVA. This type if divided by two types of cable – H-Type Cables and SL-Type Cables. The H-Type Cable was designed by M. Hochstadter. Each of the three cores is insulated by a paper and then wrapped by a perforated metallic screen or cover. The three metallic screens are later on grouped together by a copper or other metallic covers. The main benefit of the H-Type Cable is that it improves the heat dissipation. Another one is the SL-Type Cable which is similarly constructed with the H-Type. The only difference is that the SL-Type’s three cores are individually covered with lead sheaths. Unfortunately, it’s only limited to up to 66kV. The sheaths are also thin so moisture may penetrate the cable. On the other hand, there’s also the H.S.L. Type Cables which is combination of H type and S.L. type cable. Pressure cables: the maximum voltage of more than 66KVA. It is classified to two types – the oil filled cables and the gas filled cables.